OK so it’s Friday the 13th and for some people that can be a bit of a scary time, especially a few weeks before Halloween. You’re peeking out your curtains nervously for any signs of black cats. You’re avoiding taking any flights, or any unnecessarily long car journeys. You’re staying well away from the big kitchen knife, and you’re gonna skip any walks by the sea or other potentially dangerous bodies of water. We get it, you’re nervous, so we’re here to look at the positives. Find the bright side on the date ominously known as the unluckiest of the Gregorian calendar. Look, whatever about the 13th, the fact is it’s Friday. TGIF. It’s the end of the working week, so stop thinking of all the bad things that can happen, instead think of all the good things that WILL be happening this weekend. Let us know in the comments what you’re doing to throw off the shadow of this spooky day. Yea, pointing the finger at ourselves here. But really, if people weren’t going on about it, it would probably pass you by without even noticing it. We’ve already had a Friday the 13th this year back in January, and you probably don’t even remember it. By the time the next one rolls around in April 2018, you probably won’t remember this one either. 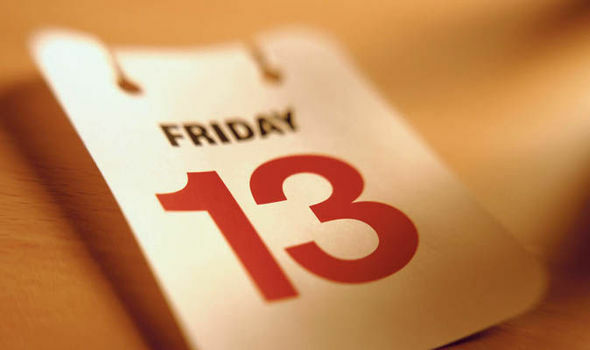 Fears of the number 13 and the day Friday have stretched back to at least the Middle Ages, but no one really connected the two into a date of superstition until the 19th Century. How legitimate can a fear be if it’s only been around a couple of measly centuries? I bet you’re feeling better already. There’s very little research to suggest that today is any more unlucky than any other day of the year. Scientists have done their science thing, they’ve crunched the numbers and they’ve decided it’s no big deal. Mostly. You may be surprised to learn that good things actually happen on Friday the 13th, as outlined in this article in Time. Frankly I’m not entirely convinced that patenting the accordion is a high point in human development, but we’ll take what we can in the circumstances. This piece from the UK’s Telegraph outlines how Friday the 13th, because of its negative connotations, reduces costs in particular areas. So, for example, the cheapest day to fly that year, was Friday June 13th. If you’re not prone to superstition, you could probably bag a cheap flight April 13th next year – just as we start into Summer. Spanish-speaking countries fear Tuesday the 13th, and Italians fear Friday the 17th, so there’s no consensus even in the West on what day we’re actually supposed to be getting all worried about. So there you go, it’s all a bit of stress for nothing. Go make yourself a green tea and relax. But if you’re still worried you could always talk to a 7th Sense psychic and get the inside track on how the 13th is going to turn out for you! I always, as far back as I can remember, have horrible luck, bad news, deaths or break ups come my way on Friday the 13th. I’d rather just stay under the covers than get out of bed. I wake and try to think positive thoughts hoping it will somehow change my Friday 13th destiny. My Friday the 13th started off kind of wild but the day was good and it ended on a calm and peaceful note. There was a layer of mystery that spread over the whole day that added to the mystic fall weather and I loved it! !